The Town Council offices in Market Street continue to house its resident and visitor information point situated in the front reception. Visitors to the town and local residents are being offered a one-stop pick-up point for all enquiries and a wide range of locally produced leaflets, brochures and other information is readily available. “Our information displays contain excellent sources of information on a number of different things. 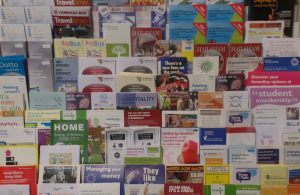 Furthermore, copies of the latest Town Council Newsletter, Hailsham Town Guides, area maps, and information on some of Hailsham’s public open spaces are available for people to read or take away.